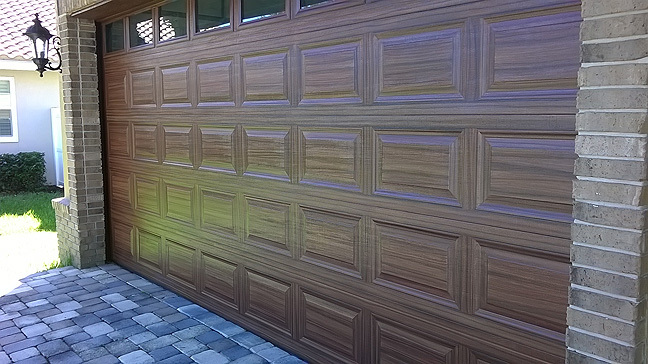 I completed a project here in St. Petersburg in which I painted a double garage door to look like wood. The garage door really came out great and the client loved it. In this first picture you can see where I have already scrubbed the door clean and primed it. Then I am half way done painting on the base coat. The base coat is on here in the second picture. Its not unusual for the client to get a little nervous at this point seeing the orange color. 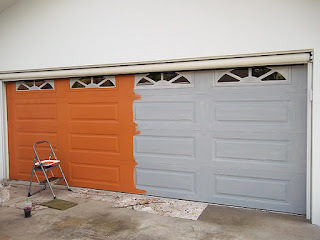 This color for the garage door is a Sherwin Williams color called True Penny. Painting around the 'Star Burst' windows is a challenge. It takes much longer to paint those than if they weren't there at all. Now the double garage door is starting look good. In the next picture I have painted the center panels and the vertical areas between them. I have the top horizontal area taped off and have painted the first wood grain color there. 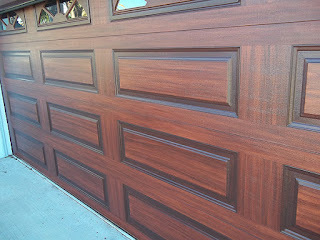 For this door I am using a SW color called Fiery Brown. For the second coat I mix black into the Fiery Brown at least 1:1 and maybe even a little more black than that. I always use at least two wood grain colors. I find this gives the doors a deeper and richer look. The door is done and looking good. You can see how using the orange paint really gives the garage door a rich warm inviting wood grain tone. Take note of the beveled areas around the center panels. After the two wood grain coats I go back once again and do what I call 'picture frame' the panels by painting another coat of the dark color on the beveled areas. Here's a closer view of the panels. If you look you can still some wood graining on 'picture frame' beveled areas even though they are pretty dark brown at this point. My question is on the taping. Do you tape over previously painted areas, or just careful not to go over them again? And why do you not paint the center horizontals at the same time as the long horizontal areas? Sorry, last one. Are all coats satin including basecoats? I could spray my basecoat right? My airless with a fine tip produces a smooth finish, leaving no texture. 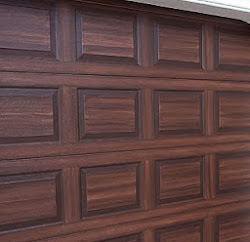 And how about the trim surrounding the garage door, do you do those solid color or grain them as well? 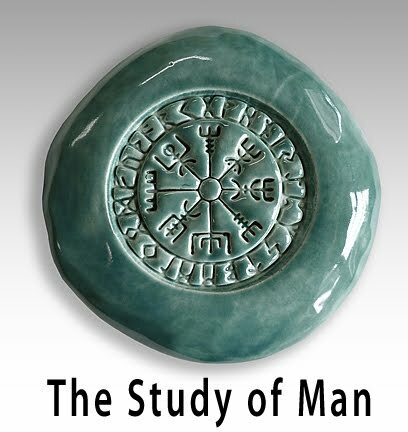 Thanks again for your time and for putting this resource together. Yes, you could spray the base coat on for sure. If you read the tutorial in the top menu bar then you read where I think the most important part of any painting project is the surface prep. 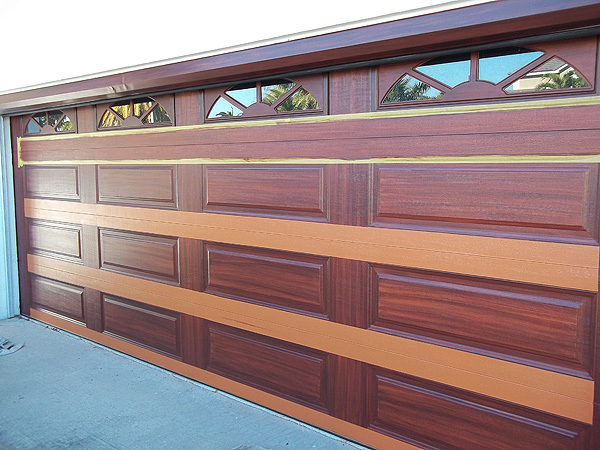 With garage doors that means cleaning really well first. Sometimes I paint the trim around the door and sometimes I do not. If the door is white and the weather strip is white also and the surrounding house color is different I pretty much paint the trim otherwise you will be left with a white strip around the door. One thing I have done several times in those situations is paint the weather strip the color of the house. That looks good too. The way I tape I do not have to tape over previously painted surface until it is pretty dry. I only use the delicate surface tape or the yellow frog tape. Once the paint is dry you can tape right over it. Sometimes here in Florida that means 15 to 20 minutes but never longer than an hour. The long horizontals are actually difficult to give a good wood grain look too. It again has to do with the dry time. I want those areas isolated so I can work it as fast as possible to keep the long grain look going without having overlap brush lines or stop and start brush marks. I always use satin as a sheen level. Some like a semi-gloss but it ends up looking to shiny for my tastes and flat is out of the question. I will be doing my door soon, so anxious I may do it before the house. Thanks for the heads up on the long horizontals drying too quick. I may use a product X-I-M latex extender to help on those areas, or maybe even on the whole thing. There would be nothing worse then to have lap marks. I am in Florida also, West Palm Beach. Ever try to use a paint extender? I heard this was a lot better then floetrol, the one available at the H Depot. I have used the xim before and its a good product but I have never used it on a garage door. Just dont' use too much of it. Yes, its better than floetrol. I always, always reccomend you practice on a sample board first to get the 'stroke' down. This way you can feel comfortable with making the grain pattern before you start on the door itself. I've been reviewing your tutorials and admiring the great work you have posted on your blog here. Awesome! You mention satin sheen level. If satin is used for the latex, what sheen do you recommend for base coat and clear coat? Also, do you simply apply the exterior clear coat after tone coat or is there another step? You mention a UV sealer in another post, but I am not sure if that is the clear coat/poly that you are referring to. My garage door faces due West and will take a pounding from the hot afternoon SoCal sun. Any and all tips (sheen, # of coats, applicator, how many months or years before re-coat, etc) at the final clear coat step would be greatly appreciated. I always use satin sheen all the way thru unless the client requests another sheen and truthfully nobody does. The clear coat and uv sealer are the same, just semantics there. I put the uv sealer on last. I live and work in Florida and believe me I know about west facing garage doors. That's why if you read my instructions you'll see that I rig a shade up when painting in the sun. You can't paint on the door if the sun is hitting directly on the door. You need to make some sort of shade to work in. The reason I use the uv is just because of the fact that I work in FL and the sun is brutal here. 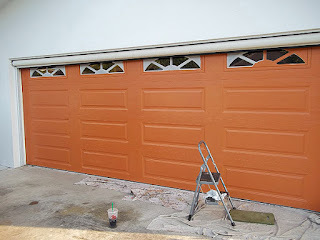 I have been painting the garage doors for about 7 years and they still look good. I have been reading through all of your information and love the look you have created. I have made so many notes...was wondering if you have step by step instructions writen out to keep handy and to remind myself of all the important issue. 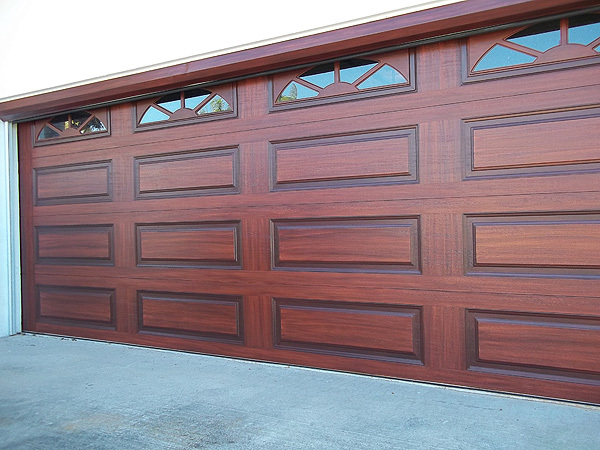 I am going to attempt this look here in Indiana and want it to look as amazing as your doors. A little nervous with it being out there for all to see, my neighbors can be a little critical and would love to have this look great. Thank you for all the great information and advise. Michelle, look at the top of this page and see the tab for the garage door tutorial, it should answer all your questions. Hope this helps. Beautiful work. I wish you were near NW Arkansas as I have three doors I'd love for you to finish. Can you advise what products you would use if you wanted a red mahogany finish with deep (black)grain? Bill, check out my garage door tutorial, its on the main menu bar above. It should answer all your questions. For a reddish mahogany I use a base coat color from Sherwin Williams called true penny. its kinda of a pumpkin color. Then for the brown I use a Sherwin W color called Fiery Brown. I would mix some of that in the black for the second pass. I use Tricorn black from SW as well. Those are the colors I used on the door above. Hope this helps.